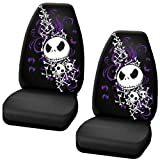 Instantly customize your car, truck, van, or SUV with this brand new set of seat covers. Seating surfaces feature urethane foam backing for increased comfort and temperature control. Rear and underside of seat cover trimmed with black mesh material for a finished look. Durable high quality stretch polyester material with foam backing. Anti-fading coloring process keeps seat covers looking bright. Machine washable. Seat covers install easily with attached elastic cords and included “S” hooks.